No, this is not a cyclops with a smiley face. If only this sad similarity could make it so. What is this thing? It looks "familiar," in a way, as if it were just another instance of graffiti on a wall. Out of its context, there is little about this cartoonish marking that would cause us to suspect the sinister intent behind it. Thus we have an "N" with a circle around it, spray-painted on a wall. 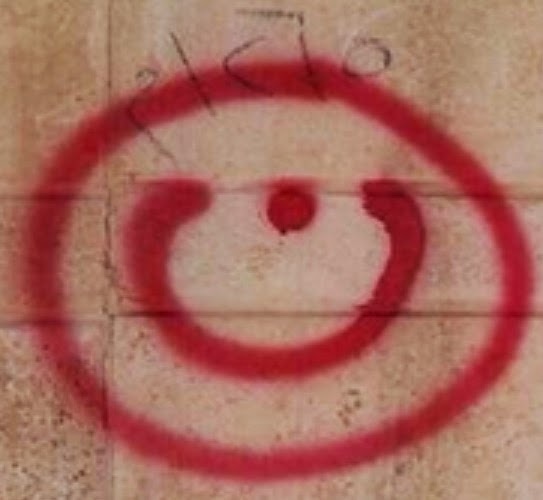 The circle with the letter nun, however, is found on walls and doors all over a town in the Middle East. The town is Mosul, in the province of Nineveh, in a country that -- for now, at least -- still bears the name of "Iraq." 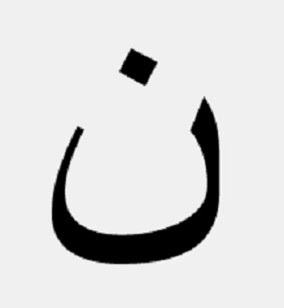 The "N" stands for Nasara. Nazarene. It marks the dwelling places and the property of "the Nazarenes." This is a derogatory Muslim term for those who follow "the Nazarene," the man from Nazareth. A violent Islamic jihad organization that styles itself (most recently) as "the Islamic State" is marching toward Baghdad. There they hope to realize the bizarre and destructive fantasy of restoring the Islamic Empire. There is a grim, grey bearded lunatic among them who has already proclaimed himself Caliph. The I.S. is a revolutionary force born from the tumult in Syria. Their success in Iraq is due primarily to alliances with disaffected Sunnis who feel oppressed by the Shiite dominated government in Baghdad, and to the incoherence of the Shiite government, which has accomplished little beyond oppressing the Sunnis. The world groans at these wars that won't go away. A passenger airline shot down over Ukraine. Israel and Gaza. And this too; what is one to make of it? Iraq is falling apart, and Kurdistan is beginning to look like the safest place in the region. But there is a deeper violence at work here. 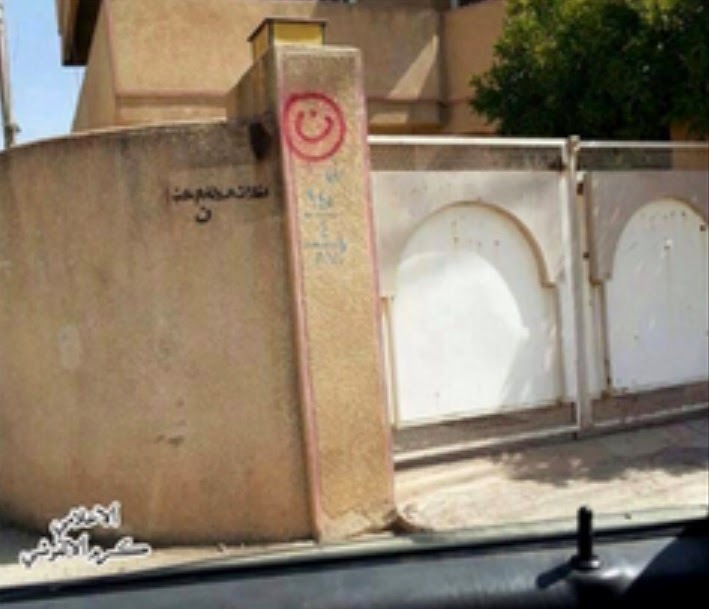 The Islamic State gave the followers of the Nazarene an ultimatum: Convert to Islam, pay a crippling "religion tax," go into exile, or be put to death. The "N" marks the property of Christians. It indicates, ironically, that this property no longer belongs to them. In fact, the Chaldean Christians have been in this region since the time of Jesus of Nazareth. They are the ancient inhabitants of this region, the children of Abraham's cousins. They have remained distinct from the Arabs who conquered them in the first millennium, but they have lived with them. Along with other ancient Christian communities, they have contributed to the formation of complex societies in the lands of Syria, Lebanon, and Iraq (and also Egypt). These societies built up centuries of religious tolerance. But these societies could not endure the political exigencies of globalization. It is an atmosphere where radicals flourish, and ancient peoples are worn down relentlessly. The West has experienced terrorism at the hands of radical jihadists. Chaldean Christians, however, are being subjected to the horror of genocide. The mad Caliphate is not likely to last, but it may last long enough to finish the work of dispersing and destroying the heritage of one of the world's most ancient communities. The Christians of Mosul have fled to Kurdistan. Their churches are being burned. The Mass is no longer offered in Mosul. The people who have given continuous witness in the land of Abraham to Him who is the son of Abraham are perhaps finishing the long journey into exile that began a decade ago, when radical groups emerged following the downfall of the secular dictatorship. We must pray and make sacrifices for our suffering brothers and sisters. We must remember them. We must embrace them in our hearts, in solidarity. We pray, above all, that their faith will endure. A heritage may pass away. A people may disappear from history. But they will rise again, by the power of the One who dies no more, over whom death has no power. Because the Man from Nazareth is risen from the dead.